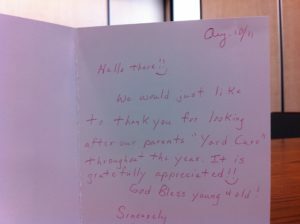 We would just like to thank you for looking after our parents “Yard Care” throughout the year. It is gratefully appreciated :). God Bless young & old! It was signed by four people. 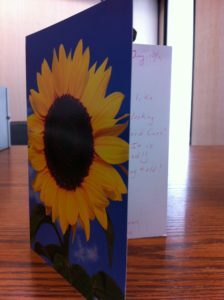 They even sent some money along with the card. There is no doubt that everyone on the block is well aware of who we are. There is also no doubt that people talk about what we have done after we leave! Each week when we make ourselves available to them, we prove to them that the people from Church of the Rock care. It’s always encouraging to get things like this because it reaffirms the fact that we are making a difference, one person at a time.